Let's be honest: Without guns and missiles, there's little to differentiate military aviation from the kind of flying the rest of us are used to. And though we take for granted just how amazing it is that we can make giant tin cans fly across the world, attaching things that go "BOOM" to those tin cans still gives those of us with the minds of adolescent males a bit more of a thrill. After all, without weapons, Top Gun would just be - Top. Hence the need for weapons, and the sailors who maintain them on naval aircraft: Aviation ordnancemen (AO). The Navy's Enlisted Classification Manual adds that AOs can even be responsible for a variety of equipment that is very much not involved in blowing things up, but still vital to ordnance operations aboard ship, such as "sprinkler systems . . . [and aircraft] carrier weapons elevators." Not all ordnancemen are stuck on the concrete waiting for the planes to come home, mind you. According to Navy Personnel Command, the truly qualified can earn additional flight pay by volunteering to be naval aircrew. 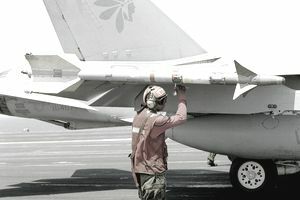 As with all sailors, a high school diploma and qualifying scores on the Armed Services Vocational Aptitude Battery (ASVAB) are required to join the aviation ordnance community. One of two minimum scores, resulting from different combinations of test categories, are required: Verbal expression, arithmetic reasoning, and auto/shop must add up to 185 or higher, or else mechanical knowledge, auto/shop, and assembling objects scores must equal at least 140. Although they're not required to be US citizens, potential AOs must also establish themselves as trustworthy by qualifying at least for a "classified" security clearance level. Enlistees in ordnance fall in, at first, with the rest of the sailors at Naval Station Great Lakes, Illinois for Navy basic training. Following induction into the sailor's way of life, specific training begins at Naval Air Station (NAS) Pensacola, Florida, where instructors spend nine weeks preparing candidates to work with the big guns. According to the AO rating information card from Navy Credentialing Opportunities On Line (COOL), the ordinance "A" school covers "[a]viation basic theory . . . and electronics troubleshooting." Graduates must also spend two to three weeks in follow-on training that prepares them for a specific assignment, either as part of a ship's complement or a member of an airwing. Also, the United Services Military Apprenticeship Program allows AOs to use the on-the-job experience to earn journeyman apprenticeship status as ordnance artificers, aviation ordnancemen, or armory technicians.